Author: Dr. Tyrone Holmes, Ed.D. 1. This is a very hard training program so you should be in excellent physical condition from the start. 2. The plan consists of three, 28-day mesocycles. As such, it takes a 23/5 training approach (23 days of relatively hard training with 5 days of recovery). 3. Make sure you actually recover during the recovery block - you'll need it! 4. Ride frequency is 5 days/week. 5. Some of the workouts will require an indoor trainer (e.g., Pyramid Intervals, Single-Leg Training and Pyramid Intervals: Constant Cadence). 6. There are two high-intensity workouts each week. These are the "bread and butter" workouts that will increase your power output. Your aim is to be at full strength for each of these high-intensity workouts. There is also one long ride each week designed to maintain your aerobic endurance. 7. There is a Field Test (FT) the final week of each mesocycle to assess your progress. 8. Intensity is measured via FTP-based power levels for every workout. Therefore, you'll need to know your FTP and training zones. If you don't, use the Field Test to determine your FTP and create training zones using the power-based levels proffered by Dr. Andy Coggan and Hunter Allen. Let me know if you have any questions and have fun! NOTE: Do this workout on an indoor trainer. Begin the interval at a cadence of 90 rpm. Every 60 seconds, shift up one gear but decrease your cadence by 5 rpm. Increase gearing/decrease cadence 2 times (90 rpm to 85 rpm to 80 rpm), and then reverse the process by decreasing your gearing and increasing your cadence by 5 rpm every 60 seconds until you finish where you started (up and down the pyramid). Start in a gear that gets your power output to the top half of Zone 3 (76-90% of FTP). At the top of the pyramid, your power output should be in Zone 4 (91-105% of FTP). Ride at a cadence of 85-95 rpm in Zone 1 (<55% of FTP) with several 100+ rpm high-cadence spin-ups. Begin with your right foot clipped in and your left foot hooked over the back of the trainer. Spin in a low gear for 30-60 seconds at 80-90 rpm. Concentrate on spinning in circles and lifting your leg on the upstroke. Switch to your left foot and spin for 30-60 seconds. Next, spin in an easy gear with both legs for 1 minute. This constitutes 1 set. Repeat for a total of 5 sets. Pedal easily for 5-10 minutes. Then do a series of 60 second sprints with 2 minutes recovery between each hard effort. NOTE: Get into a small gear for the one-legged spinning. Your goal is to improve your pedal stroke, not push against a heavy resistance. Pedal a steady cadence of 85-95 rpm in Zone 1 (<55% of FTP). Pedal a steady cadence of 85-95 rpm in Zone 2 (56-75% of FTP). I provide Cycle-Max Coaching for athletes who want to improve their performance on the bike and Healthy Life Coaching for individuals who want to lose weight, enhance their fitness and live a healthier lifestyle. 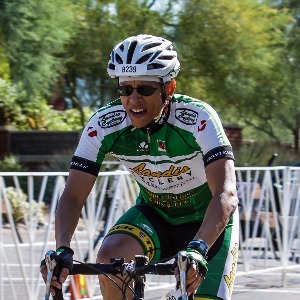 I specialize in helping cyclists and multisport athletes achieve their performance goals by increasing power on the bike.